After recently moving I've been unpacking my books. Here is an oldie but goodie that I hadn't put my book notes up on. Marty Neumeier calls for the creation of Designful companies. Arguing that the more successful companies are those that can differentiate their experiences (products and services and brands) from the competition in meaningful (and valuable) ways for customers. A successful way to repeatedly do this is through innovation and change directed by the practice and philosophy of design being part of the culture of a company. Survey …1,500 top executives … wickedest problems plaguing their companies today … while the list included the usual suspects of profits and growth, it also revealed concerns that hadn’t shown up on corporate radar screens utnil now: aligning strategy with customer experience, addressing eco-sustainability, collaborating across silos, and embracing social reponsibility. Use design to create differentiated products and services that delight customers. Today we need a broader definition of design in which the key measurement is not styling but performance. You just need to find a situation worth improving and then work through the creative process. Managers can use it to design high-functioning teams. Environmental designers can use it to design engaging experiences. If you probe more deeply into what drives innovation, only a few will understand that innovation comes from company culture. The same principles that activate other forms of art will soon be essential to the art of management. Why? Because the more technological our culture becomes, the more we’ll need the sensual and metaphorical power of beauty. … wield culture as a competitive weapon. Since respect comes from a combination of performance and proactivity, mimicking a successful design studio can trigger the same level of respect usually reserved for external firms. It can develop its own engagement processes, seek interesting problems to solve, and make “pitches” to internal clients. What if the internal design department could jump-start design thinking by running educational programs on innovation, design thinking, and brand-building? Design management should never be outsourced … conversely many of the design skills needed to execute brand-related projects should ALWAYS be outsourced, since the outside is where you find best-of-breed specialists. The primary tool for creative collaboration - and one that’s under-employed today - is the design brief. A well-conceived brief can focus collaborators on the common goal, reduce the costs of orientation, allocate roles and responsibilities, and provide a framework for metrics. You have to wonder about a CEO that needs a survey to find out if his employees are happy. … act as master facilitator of his creative metateam, pulling ideas up through the pyramid instead of driving them down from the top. The journey of the innovator, as one designer described it, is learning how to “cut cubes out of clouds.” How can you give sharp edges to a soft concept so everyone can see it? How can you make the intangible tangible? … people no longer want jobs - they want support to fulfill their dreams. I really like the double diamond design framework. No its not the only framework out there. But other than it having a really cool name whats makes it work. How is it different than any other recipe? Where's the magic at? One ingredient of the secret sauce is in the ability to "hold off." Its the ability for designers to wait before converging. Its the ability for you in your mind to say that right now I am just going to keep going strong on diverging, keep going beyond the comfort of knowing I can do or make something, going beyond what is known to be possible. Equally, its when you are in the converging part that you don't start to explore another great idea. Its how you stay focused on cutting, reducing, criticizing. Its both giving permission and waiting. Its patience, trust, and not trying to do it all at once. It is the opposable mind being able to keeping at bay the desire to do two things at once. Golden Krishna asks us to not solve problems with screens, to not chase eyeballs and there by distract people from what really matters. He asks us to “dream of a screenless world” and paints a compelling near term view of it. He ask designers to make apps that work best when kept in our pockets. He rails against the pedesrian view of UX as UI that has led us to more and more screen-based thinking. They’re cranking out glorified digital billboards masked as websites and apps that are trying to monetize your eyeballs by pushing creepy ads onto all your screens. They shift away from the functional ideals of user experience design that made their services initially popular, and become more like sitcom television; get people to go brain-dead staring at a screen for as long and as often as possible. I believe our job as designers is to give you what you need as quickly and as elegantly as we can. Our job as designers is to take you away from technology. Our job as designers is to make you smile. To make a profit by providing you something that enhances your life in the most seamless and wonderful way possible. 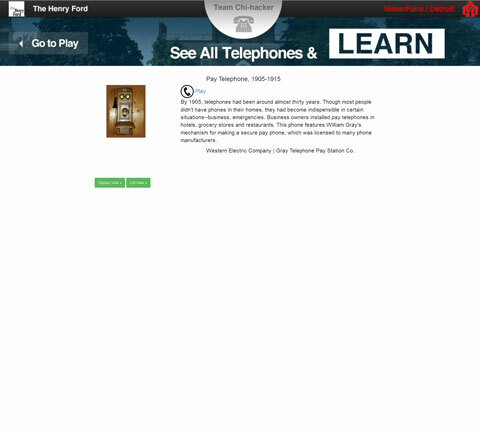 Easily accessible, they seamlessly and continuously received one kind of information. Instead of relying on painful user input like form fields and website navigation, the computer system used automatic, sensory, signal-based machine input. Like my award winning Mango + Mole chili there are some things call out to be mixed together. Take wearables oriented toward health & wellness delivering dry information. When people are exercising they also need motivation and encouragement. How can we take those quick glaneable UIs which physical exercise usage calls for but make them more like a coach who encourages you. Motivates you. Urges you to do better. This "coaches face" conveys not just motivation but also conveys encouragement. A glanceable UI that conveys not just how you are doing but prompts you to improve. Chernoff faces are glanceable UIs. 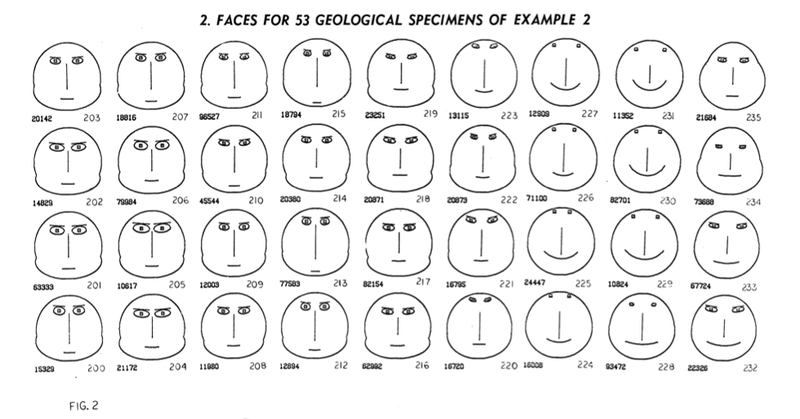 20-30 different data elements can be conveyed in a standard Chernoff face. No one has taken the human like face and taken advantage of it being a face, an actor. It is dealing with the challenge of conveying information. Most glanceable displays try to thin out the information or reduce the set of variable. But instead take a Chernoff Face approach. It directly attacks making a GLANCEABLE UI by using our inherent human specific talent of being able to see, recognize, interpret, and understand FACES. Faces are a basic element of our fundamental glacing at the phenomenological level. When can I buy my Chernoff Coach on a wrist? "I Want My Chernoff Coach On A Wrist!" 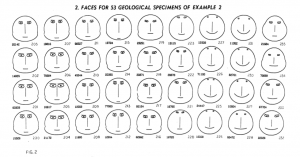 Some of Chernoff's original points in his article might support this possible new use of Chernoff faces. "Certain major characteristics of the faces are instantly observed and easily remembered in terms of emotions and appearance." "The major advantage to be derived from using the faces should be in the heightened qualitative awareness of which numerical calculations are relevant." When customers take advantage of difference “experience” costs/benefits for the same company. Reflecting on my history in customer facing automotive, retail, and fast food projects and the customers - I'm thinking about how they use technology and the resulting experiences - and their experience is an improvised totality. Customers are cobbleing together the experiences. They are engaging in “experience arbitrage” and taking advantage (the best they can) of the different costs and benefits of these experiences for the same company. Because companies have difficultly coordinating across channels, the one obvious constant is the customer themselves. A simple example is they are taking the knowledge they gain in one channel and using it in another channel. A more sophisticated example is when functionalities differ from one channel to another. One channel does not have a lock on the future. Omni-channel is an aspiration from the corporate perspective. It’s not the experience of the customer. Customers switch channels not necessarily from a “preference” they have for a particular channel but from something larger (perhaps its somethign they want to do, a feeling they want to have, or a way they think about how the world works). How well do you understand the customers you have right now? Their needs and buying behaviors? What is the pain they have in one channel that is driving them into another? 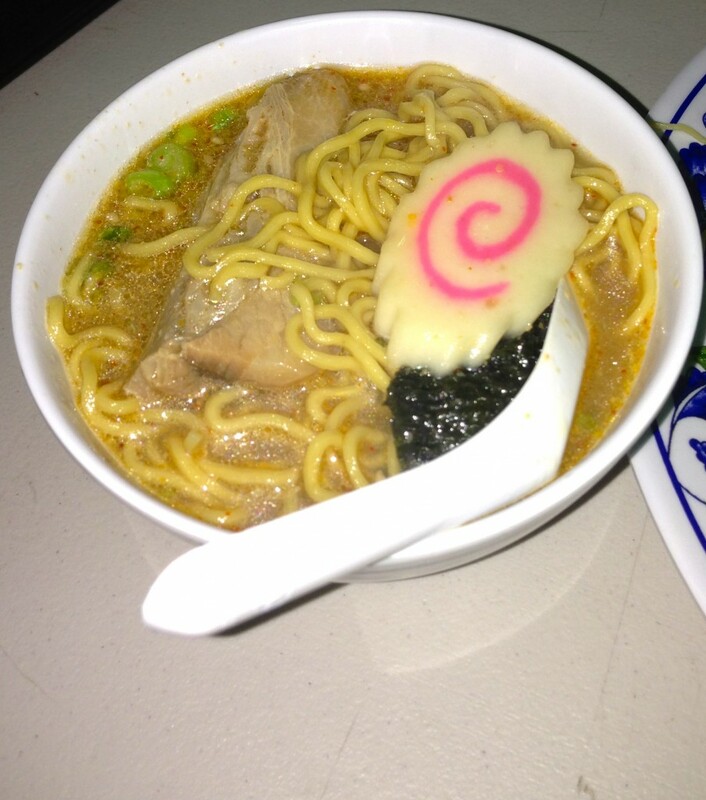 Look at this soup I had for lunch at Mitsuwa. A Japanese grocery store with a "department" store like collection of small shops and restaurant stands. Its fun to go there and figure out what to eat. Wow was it delicious. Not only did it taste good it looked good. The kids thought it looked so cool they wanted me to take a picture of it. I agree with them. A Beautiful Lunch. We won 2nd place in Hack The Museum last month. 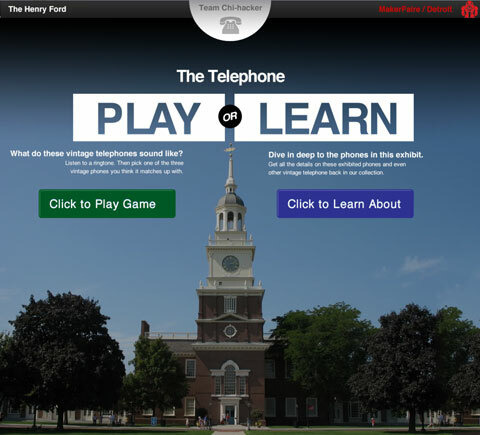 On Saturday July 27th Cody Greene, Jeff Molsen, Paul Kaiser and I competed in a Hackathon, Hack the Museum at The Henry Ford Museum in Dearborn Michigan. 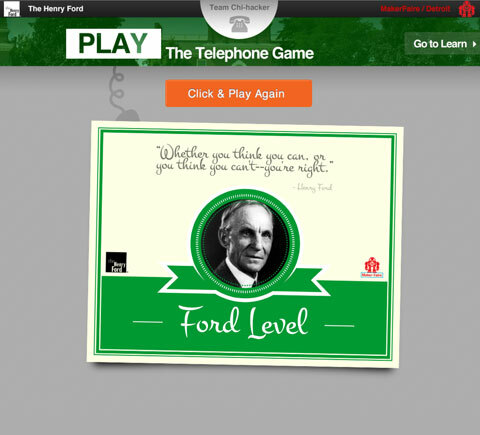 Below are some screen shots of the "telephone" game we made in ONE DAY! Yes, it worked, and yes we were tired. You know when you are looking at a big display case in a museum and you know they have more stuff in some back room but you can't see it. Well our hack solves that and gives digital access to those objects. In addition we wanted to make it a fun experience, making it into a game. This game could be played pre-visit before someone comes to the museum or perhaps by kids on a kiosk while their parents are waiting in line to buy tickets. We blended the physical and the digital. We allow the visitor to reach back into the collections from an exhibit that they are looking at and interested in. Answering "What else might be in the basement or back room?" We also allowed the different sorting/arrangement of a collection be it by date which is different than how it's ordered in the display. It is easier to resort, rearrange digital items quickly. 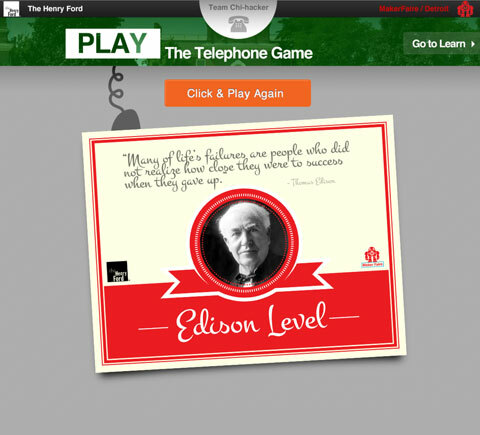 Lastly, we made a game that flipped or pivoted how people approach the objects. 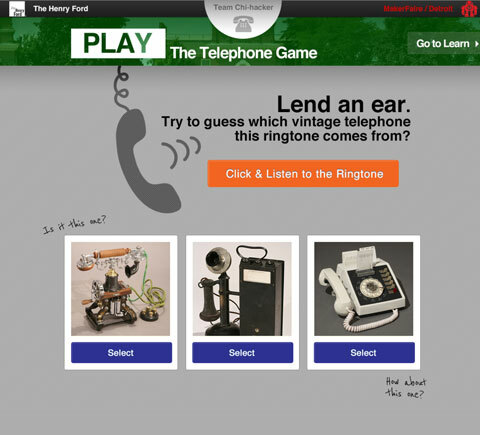 Instead of the telephone first like you see in the display, we first played a sound, and then the person had to guess which telephone made that sound. 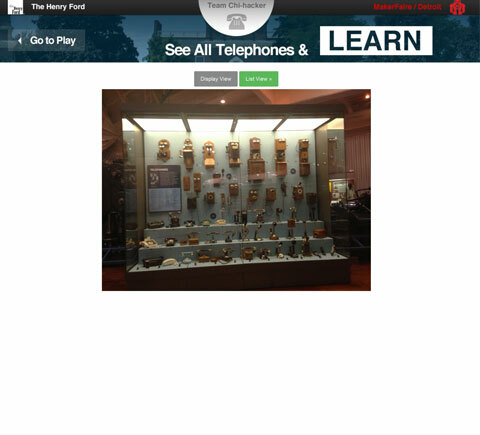 We had access to many of the museum's API, with the web API we used java JAXB to parse and unmarshall the results from xml to java which we used in our JSPs to display the results. We used java xjc to generate java classes that are analogs to the xml schema and when we unmarshall the results from calling the web service those java classes are what get populated. We used APACHE HTTP client API communicating with the web service. Here are my notes from the article "The Truth About Customer Experience"
I'll sum it up as how important it is to move from touchpoints to journey perspective. Solely looking at touch points is in my view "sub-optimization" similar to what occurred in supply chain management in which companies made just one link very excellent but resulted in "crack-the-whip" problems farther along the chain. (Supply Chain perspective comes from my work in automotive supply chains and the work of Goldratt from The Goal.) I caution trying to assess your progress with the approach if you just do step 1 and 2. I have seen the step 1 & 2 done well but the company then says "oh yes, we know that, we just can't do anything about it." The step 3 and 4 with cross functional processes and creation of "chain manager" is what is most important to deliver the value this approach can drive. p92 "A company that manages complete journeys would not only do its best with the individual transactions but also seek to understand the broader reasons for the call, address the root causes, and create feedback loops to continuously improve interactions upstream and downstream from the call." p92 "Most customers weren't fed up with any one phone call, field visit, or other interaction - in fact, they didn't care much about those singular touch points. What reduced satisfaction was something few companies manage - cumulative experiences across multiple touch points and in multiple channels over time." p92 "Most service encounters were positive in a narrow sense - employees resolved the issue and hand - but the underlying problems were avoidable, the fundamental causes went unaddressed, and the cumulative effect on the customer was decidedly negative." p92 "But even as they work hard to optimize their contributions to the customer experience, they often lose site of what customers want"
Sustaining at Scale by Changing Mind-Sets: Institute Cultural Change and continuous improvement to sustain the initiatives at scale. p93 Identify Key Journeys … both top down (executive working session) and bottom up. p94 bottom-up effort … additional research … customer and employee surveys along with operational data … regression models to understand which journeys have the greatest impact … run simulations to get potential impact. p96 delivering at scale on customer journeys requires two high-level changes that merit mention here: (1) modifying the organization and its processes to deliver excellent journeys, and (2) adjusting metrics and incentives to support journeys, not just touch points. p98… organizations must identify the appropriate metrics and create the appropriate measurement systems and incentives to support an emphasis on journeys. p98 holding the sales agent, the technician, the call center, and the back-office agents responsible for a trouble-free install and high customer satisfaction at the end of the process, instead of simply requiring a successful handoff to the next touchpoint. p98 And one large retail bank started requiring each executive-team and board member to call five dissatisfied customers a month - a simple but effective way of holding the leadership's feet to the fire on customer experience issues. p98 These efforts provided a real opportunity to differentiate not just the service experience but the brand itself. 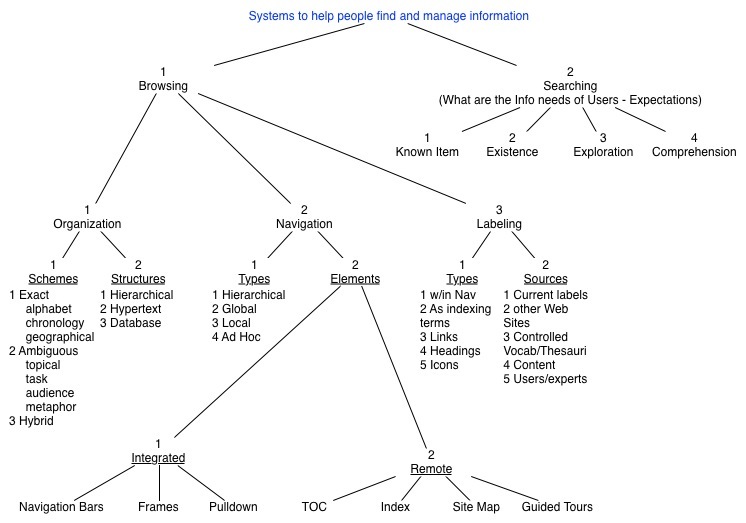 Oldie but goodie - Here is my diagram made after reading "Information Architecture for the World Wide Web" by Louis Rosenfeld & Peter Morville. It's a one page visual summary of the book. So what's the right customer experience for your company? There are three key methods you need to know about: mining unsolicited customer feedback, conducting ethnographic research, and gathering input from employees. Design is the most important business discipline that you've probably never heard of. "We celebrate technology that improves the customer experience, and we kill technologies that are no longer relevant. And when he says kill, he means it. The company holds funerals for dead software applications. When we field the Cxi survey, we ask consumers to tell us three things: How willing they are to make another purchase from each company, how likely they are to switch business to a competitor, and how likely they are to recommend each company to a friend. … a culture of compliance … this made them look hard-charging and dynamic: Tell me what you want to do and I'll go do it … but this behavior caused unneeded customer pain. . . frontline employees salute and execute any directive even if their own experience told them it was wrong for the customer. How can you help those players understand the ways in which their own actions ripple through the broad ecosystem? The best way is to deconstruct the ecosystem by mapping it. The customer understanding discipline is a set of practices that creates a consistent shared understanding of who customers are, what they want and need, and how they perceive the interactions they're having with your company today. In other words, it's the thing that replaces everyone's best guesses about customers with real, actionable insights about customers. For example, Canada Post requires all funding requests from any department to answer ten customer-focused questions in the business case. You're not going to succeed through manufacturing strength, distribution power, or information mastery - those have all been commoditized. And you can't win by controlling the flow of information about your products and services, either. … make the strategy come to life … a compelling way to do it: Turn ten thousand square feet of office space in downtown Madrid into the banking equivalent of a concept car … In just twenty minutes, you've been completely immersed in BBVA's strategy to become THE customer-centric bank. Your end goal isn't the personas and journey maps themselves. Your end goal is deep customer insights, which just happen to be encapsulated in these particular formats. Lambert created a physical listening post in Adobe's headquarters . . . that immersion program has significantly changed the company's conversations and priorities. Oliver King … says, design is an activity that's best done WITH people, not TO them. When survey responses come back, an internal system attaches operational data, such as what channel each customer used to book his or her flight and whether there were any problems with the plane they were on. That lets JetBlue analysts correlate satisfaction scores with the likely reasons that the scores rose or fell. "Sharing positive customer feedback directly with the crew members is a fantastic motivator, and a far better way of reinforcing the JetBlue experience than a supervisor providing negative feedback." It does this by capturing what actually happened during a customer interaction (such as a flight), how the customer felt about the interaction, and whether the customer is willing to recommend JetBlue afterward. "The most important thing," says Soren, "is that you must really have the courage to believe that local managers and your staff want to create a good customer experience. It's about letting go of a bit of the control. That was the hardest part." Unfortunately, many companies make huge investments in hiring and training only to inadvertently encourage employees to focus on the wrong things. How? They create operational targets for frontline employees instead of basing their incentives on the quality of the service they provide. Tom pitted market and market in a race to improve their Net Promoter Scores. consistency . . . not how well you perform it . . .We've observed that companies that consistently perform practices that are sound are way better off than companies that perform practices that MIGHT be better - but only do so on occasion. What kinds of changes to customer experience will give you that edge and allow you to pull ahead of the competition? Where should you look for your future advantage? Talk with your customers. Make it part of your everyday life … tell a fellow customer that you're an employee - as well as a customer - and that you'd love to know whether they found what they needed on that visit, and how easy or hard that was. p220 try mapping a customer experience ecosystem for one of your company's most important customer journeys. R755 theme designed by varometro. 62 queries in 0.838 seconds.